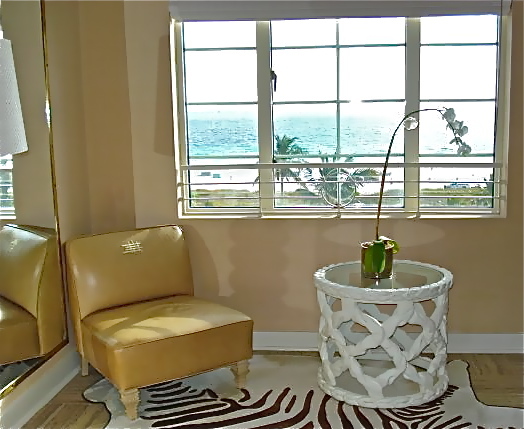 My favorite boutique hotel in South Beach Miami is the The Tides on Ocean Drive. 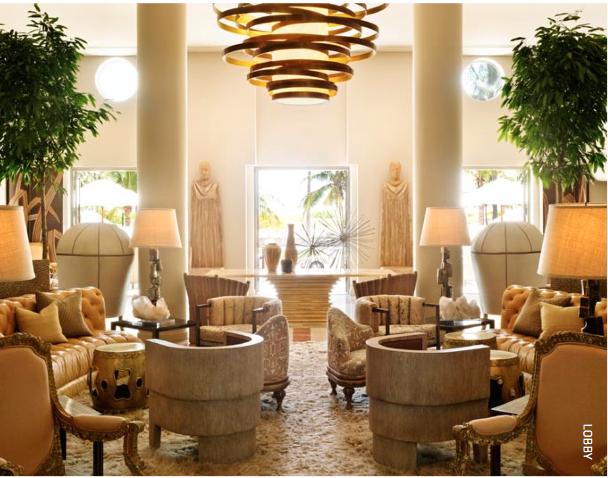 I have stayed here on multiple occasions and love the fact that it is located right on the beach, but on a much quieter section of bustling Ocean Drive (between 12th and 13th Streets) and a short walk to trendy Lincoln Road. 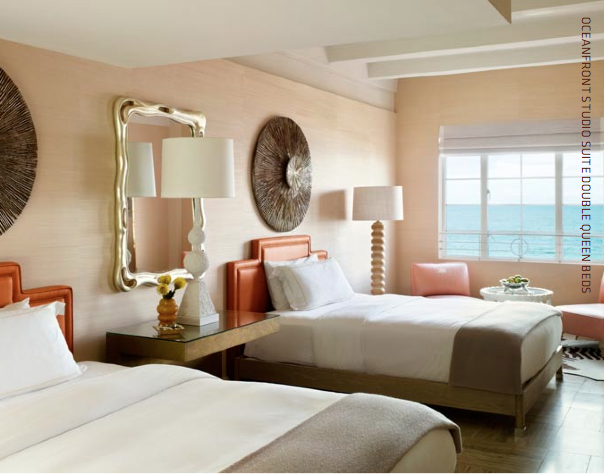 Frequently featured in design magazines, this Viceroy Hotel Group property was decorated by the famous interior designer, Kelly Wearstler, and is an absolutely beautiful setting to wake up to each morning. From the lobby lounge, to the Coral Bar, the outside terrace patio, La Marea Restaurant, the roof deck pool, and tastefully appointed rooms, the design aesthetic both inspires and relaxes. 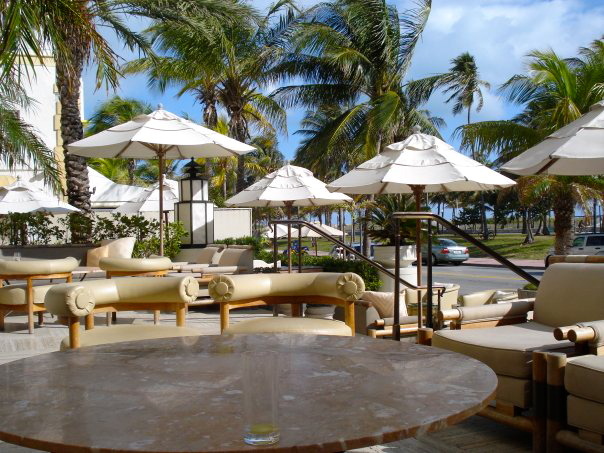 The front of the hotel has a magnificent terrace right on Ocean Drive, which serves as the perfect spot to people watch, have morning breakfast, lunch, a late afternoon snack, an early evening drink, dinner, or just to relax and catch an ocean breeze. You can order from the in-house restaurant, La Marea, and eat al-fresco. I like to order the 'small bites' such as Wagyu sliders, fish tacos and freshly made guacamole and chips paired with a cold Tides Royale cocktail (coconut rum, pineapple, splash of Chambord) before getting dressed up and hitting the dinner and nightlife scene. For those who love the beach, the Tides has their own section of lounge chairs and umbrellas on a section of the beach in front of the hotel. The front desk will give you towels and bottled water before you head out for the day. Once on the beach, you show your room key to a man who will arrange your chairs and umbrella where you wish. Another wonderful feature of the hotel, for those who want a change from going to the beach, is the roof deck pool. 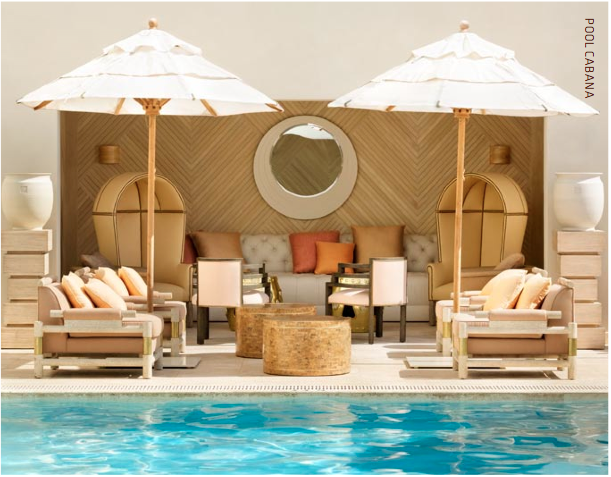 A small and intimate setting, lounge chairs line either side of the pool and there is always a pool attendant on duty should you need a cold beverage or an extra towel. I would come to the pool everyday around 3pm and lie on the white leather couch (shown below) and have a lovely nap in the shade. The set up you see below is mirrored on either end of the pool so there is plenty of space. Also, being situated towards the back of the hotel, it is extremely quite. I felt like I was in my own private mansion on South Beach. Thank you for the wonderful overview of the city. I recently moved to Miami. I really like this city and the ocean. I am very glad that I live here. When I moved, I had a lot of stuff and I applied to a moving company in Miami https://topqualitymoving.com. This good guys helped me to transport all of my luggage to my new flat. I was very pleased.